Once I had decided to walk a few days on my own, I needed a shelter that is lightweight, has a small pack size and would be easy to pitch. 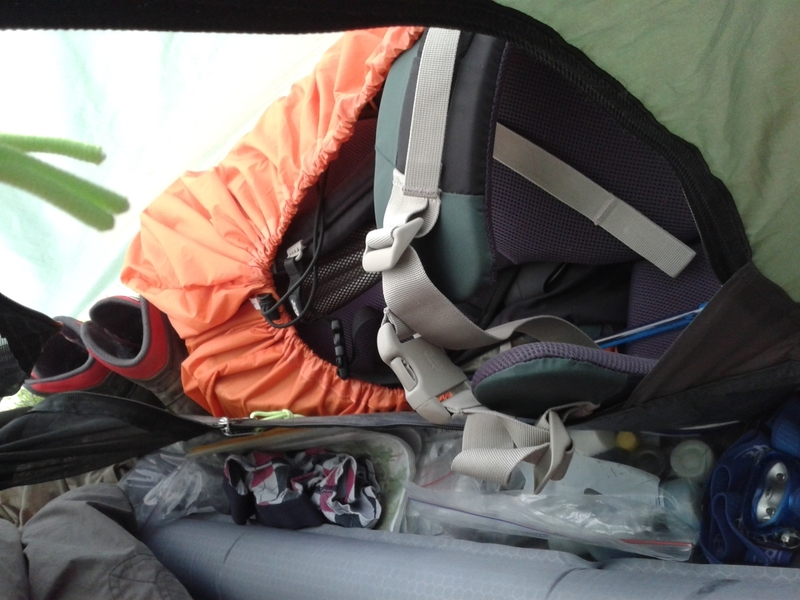 Sure, there is the option to take a tarp and bivi but somehow this idea doesn’t really appeal to me and when taking the weight and price of a tarp and bivi into consideration, I chose to stay with the “safety” of a tent since it is known to me for years. 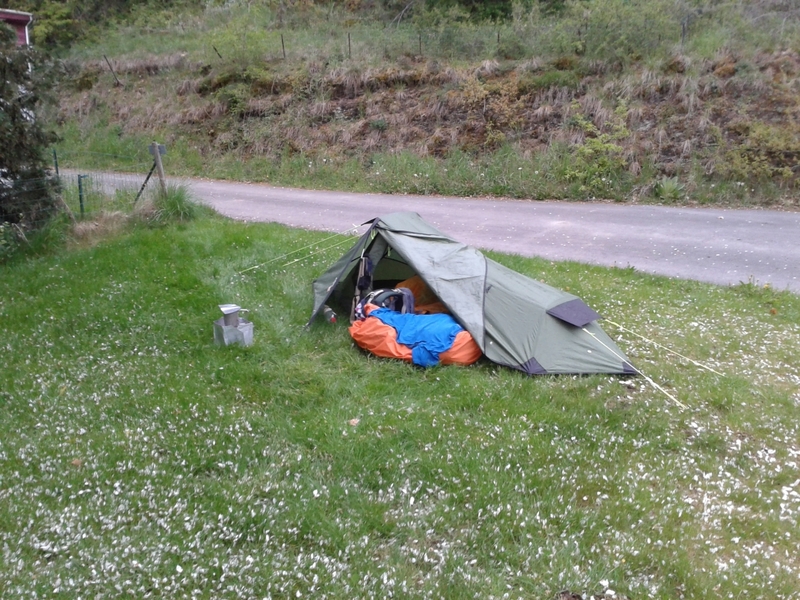 I once took a The North Face VE25 on a 4-day trip with my girlfriend, ending up not even sleeping in it since there were wooden shelters everywhere (welcome to Sweden). Now this tent is roomy for two to say the least, not to mention it is a 4-season tent so well over dimensioned for a summer outing in the forest without snow or gales. With a weight of about 4.850g (approx. 171,1oz) it also was too heavy and bulky in the pack. Not to mention the price; I was a student back then and in need of a tent I could also use for winter outings without being too expensive and I got a great deal on the TNF, multipurpose was keyword when I bought this. But for this trip I felt like a big spender. So I was looking for cheap, meaning under €100 (approx. $130). Preferably way under that; €50 would be nice. Everyone who has some knowledge of outdoor gear, knows that cheap does not mix with lightweight. Therefore the weight limit was set at a maximum of 1.500g (approx. 52,9oz). Like the price: half would be nice. So, there I went on a search on the web to find me a suitable shelter. Terra Nova’s Laser, Tarptent, MLD, ZPacks; it all looks nice but the prices were holding me back. Affordable as they may be for some, affordable is something everyone (luckily) can determine for their own, depending on their disposable income and what not. BINGO! At least my demands so far were met. I did look kind of small…maybe too small? Sitting upright would be impossible for sure but how about sleeping? 250cm in length and 90cm in width (98,4 x 35,4 inch); my Exped mat is a size M so 183cm in length and 52cm in width so this should fit with room to spare for stuff. I myself am 190cm tall (approx. 6’5”) and as I sleep on my side, this should be no problem. So I ordered my Gelert Solo tent. It didn’t take long before I received my order. Everything looks as you would expect; just fine. The tents floor is made of sturdy PU so there will be no problems with small rocks or thorns. 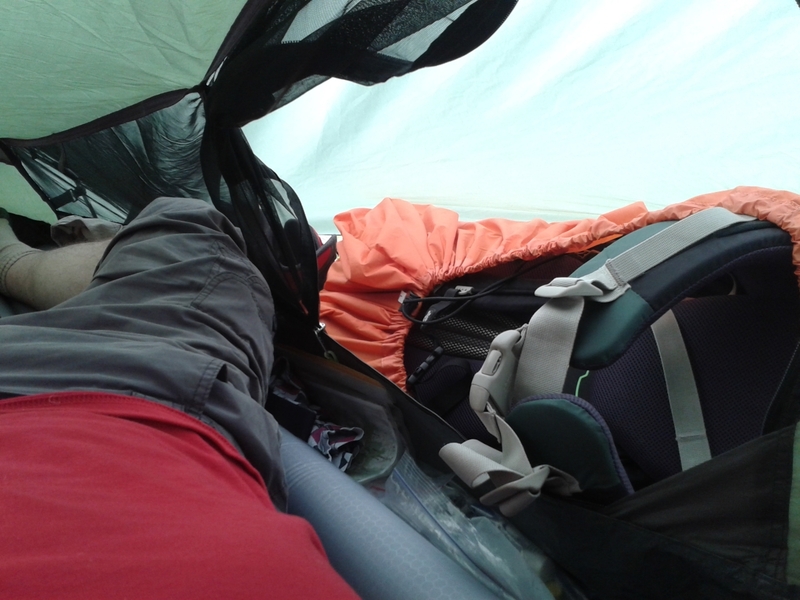 The inner tent is mostly mesh so you'll have to pitch it properly to protect yourself from any wind blowing through. Meaning someone lied or at least did not specify clearly what the 1.500g is actually made out of. When taking only the inner and outer tent, poles and stakes it still weighs over 1.500g with 1.604g or 56,8oz. Still not disappointed for the €50 however. I won’t take the pole bag with me and I will be taking the TNF stakes which are 12g a piece. This tent needs 16 stakes in total: 192g or 6,7oz. Since I want to store the tent in a 25L dry bag I won’t need the storage bag. The used dry bag weighs in at 65g (2,3oz) so it is heavier than the original bag but waterproof and easier to compress. So for me this setup will weigh 1.638g (57,8oz) which still is over my original 1.500g limit but did I mention the €50? A first pitch in my parents garden makes me doubt the size however: as expected the mat fits and so do I, although laying stretched out on my back is not an option. Further, entering and exiting the tent is going to be difficult to say the least especially since my pack has to be in front of the door if I want to keep it dry at night. But instead of worrying I decided to just put it to test during my trip. The fact that I only had about 2 weeks left before departure had nothing to do with that choice. A few things bothered me still: the fact that the outer tent is staked out with very elastic cords and the guy lines are made of some elastic material as well. 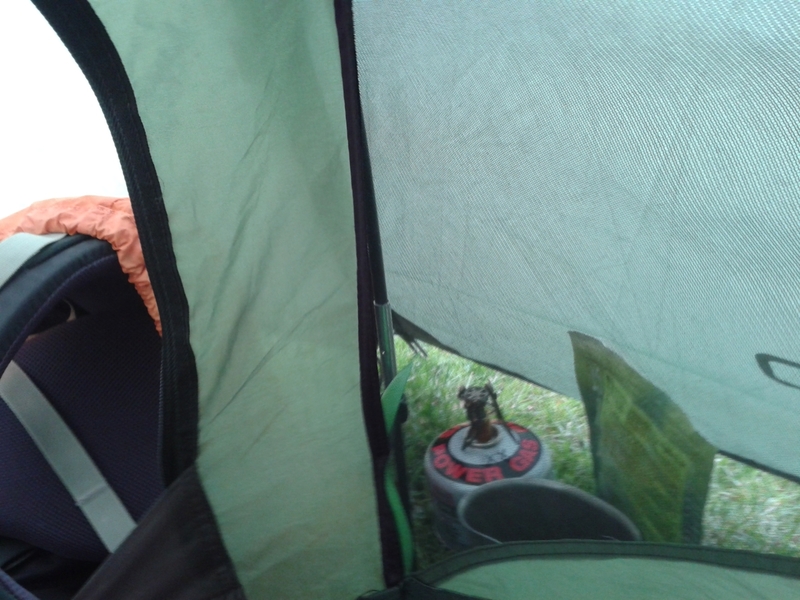 But my first night in Belgium in my new Gelert Solo tent took away my worries: it rained for almost the entire night and my tent gave a drum solo for almost the entire night, meaning it stayed taut. Who would have guessed? Staking and packing the tent is easy and doesn’t take more than 10 minutes or so each, which is acceptable to me. 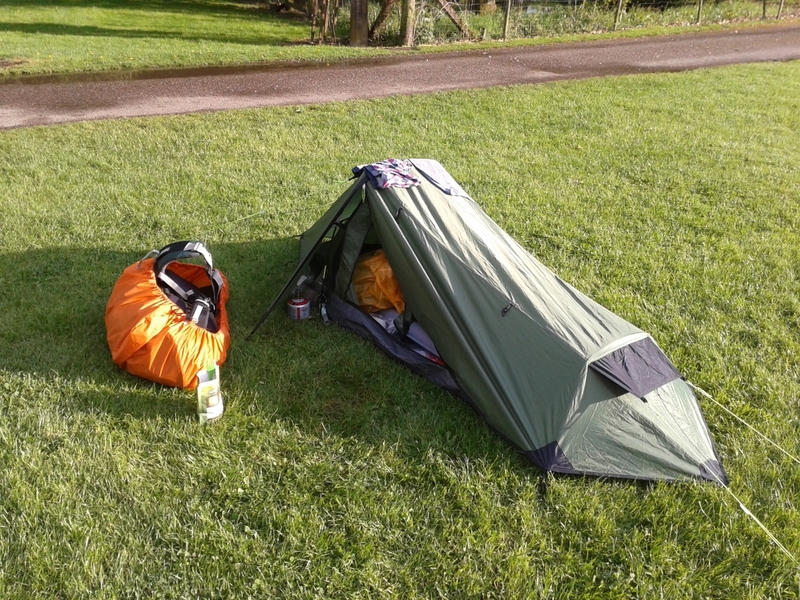 Although with heavy rain it can be a pain since you pitch the inner tent first. Luckily I was spared of this event my entire trip. It rained almost every night of the 9 nights I slept in this tent and it kept me dry every night. 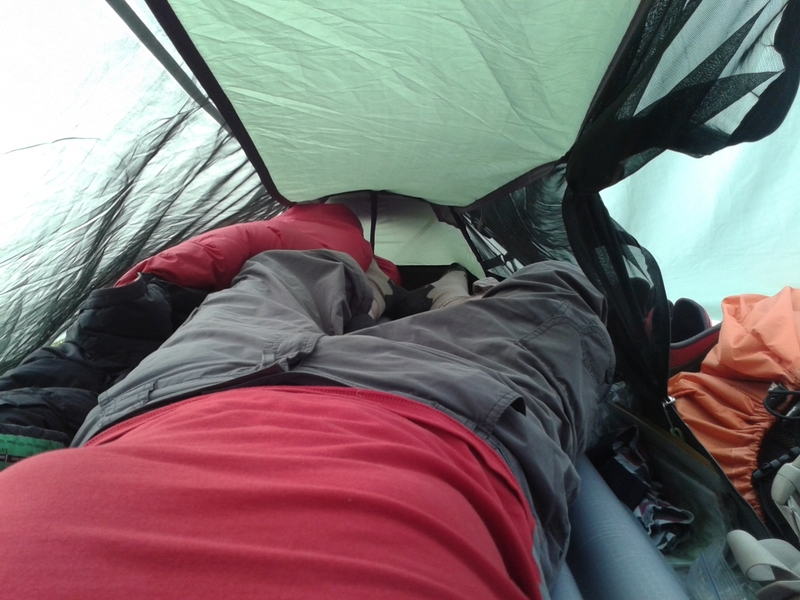 I did notice the outer tent slacks a bit when I had a resting day and did not have to take the tent down. This is probably due to the elastic cords used to stake it out. Once I’m back home I will replace these cords and the guy lines to see if that helps. It will probably result in tearing of the seams where the guy lines are attached to the outer tent but one can take a gamble with a €50 tent. You now know it keeps you dry, it’s easy to stake out and it’s weight is somewhat "UL". But how about life inside the tent? Well it’s not easy to inflate your mat due to the inner space, it’s not easy to change clothes due to the inner space and it’s not easy to make plans for your next day due to the inner space. Cooking inside is impossible and your sleeping bag will get wet due to condensation and the fact that you have almost no inner space. If you’re the type of person who likes to chill out inside your tent and roam about while doing gear repairs or trip planning, this tent will disappoint. But if you can set aside your preference for the luxury of (head) room, this tent will suit you brilliant. I accepted the lack of space and the tent seemed bigger every next night. It kind of grows on you and I can only say that I am impressed by this tent. I think 16 stakes is too much, it is too low at your feet, the poles are too thin and their shape is a risk, the condensation is annoying and entering and exiting is a circus act, but I am glad I bought this tent and took it with me on this trip. Once I changed the elastic cords and guy lines I will give it another try to see how it stays taut. In the meantime, I would be happy to answer any questions someone might have.